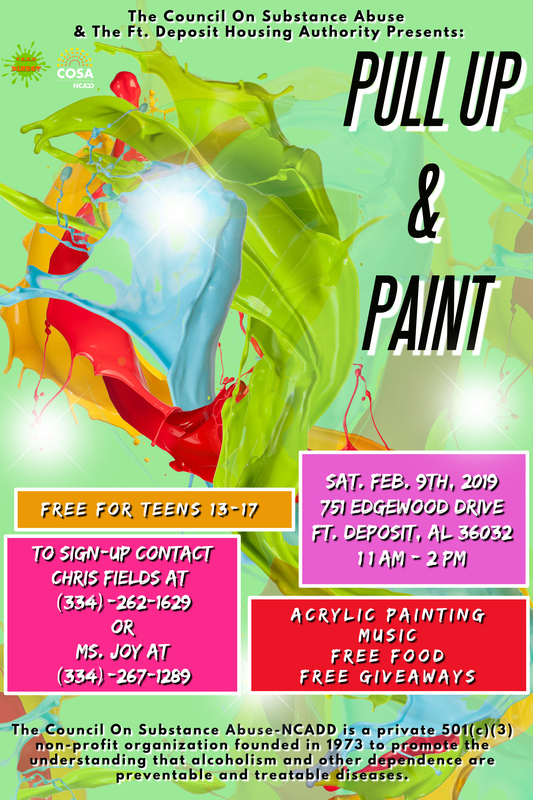 COSA-NCADD’s TEEN Direct Project is excited to announce the “PULL UP & PAINT PARTY” for teens 13-17 years old is headed to Ft. Deposit! TEEN Direct is partnering with the Ft. Deposit Housing Authority to bring this free, one day event of fun, giveaways, live music and much more to the youth of Ft. Deposit. Chris Fields will facilitate this event and introduce participants in a unique style of painting called acrylic pouring. Please arrive early to ensure that you have a seat because seats are limited. Seats are first come, first serve! If you have any further question or concerns please contact Christopher Fields at 334-262-1629.